The water buffaloes surprised me. Like something in a photo from Cambodia or China, but not in the countryside of Campania. But there they are, and have been for centuries. One theory says they came to Italy with Goth invaders about 1,500 years ago. Others suggest Arabs brought them to Sicily, and the Normans spread them to the southern mainland. And some think they are native to the area. However they got there, I’m glad they did. 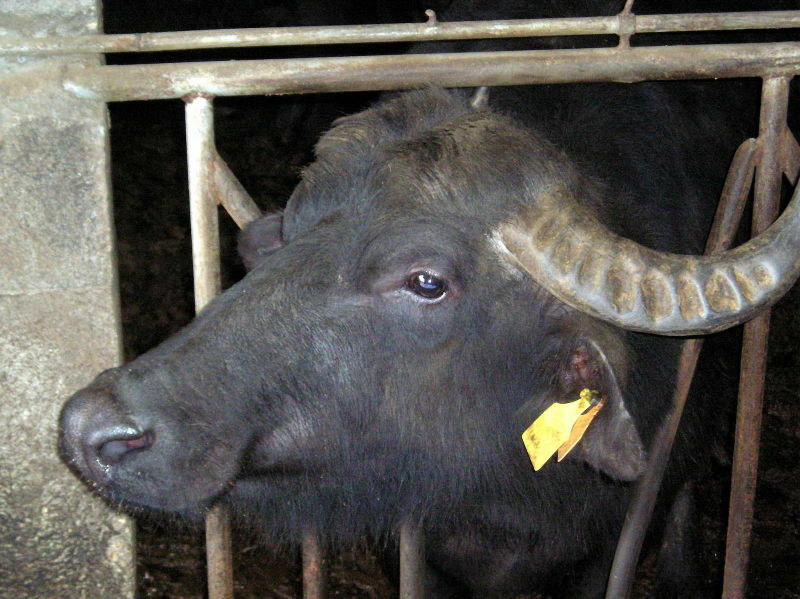 Initially used as draft animals, there are some references to cheese products from the buffalo’s rich milk as early as the twelfth century. The mozzarella di bufala we know today came to prominence in southern Italy 200 to 300 years ago. When I spent a few weeks in Sorrento, I was told that only cheese made from buffalo milk can be labeled ‘mozzarella’ in that part of Italy. Fresh mozzarella, those soft bright white balls, must be kept in a ‘broth’ and is very perishable, so should be used quickly. While mozzarella can be made from cows’ milk (and unless it is labeled ‘di bufala’, it probably is), the buffalo version is much richer and more flavorful. The most familiar use of mozzarella di bufala, for tourists in Italy, is the ubiquitous Caprese salad: Alternating slices of fresh tomatoes and creamy cheese, interlaced with fresh leaves of basil, and drizzled with olive oil and balsamic vinegar. Perfetto! Though both are called mozzarella, the fresh version seems to have no relationship to the shredded dry cheese melted on pizza all over America. For a real treat, use some thinly sliced fresh mozzarella next time you make a pizza, or top your next baked pasta dish with it during the last few minutes of cooking. If you make the mistake I did in Italy, and call it mozzarella di “bufalo” the Italians will laugh. Everyone knows it is “di bufala” and if you try to get milk from a “bufalo” you’ll be in trouble. Ready to try cooking with fresh mozzarella? In 2009, Alanna Kellogg (www.blogher.com) posted ten recipes here: http://www.blogher.com/ten-summer-recipes-fresh-mozzeralla. Put one together today, and as you eat it, imagine you are in the Italian south, eating lunch on your terrace with a warm breeze carrying the fragrance of basil and oregano. Salute! This entry was posted in Food and tagged bufala, buffalo, cooking, food, Italy, mozzarella. Bookmark the permalink. ← 5th Friday Surprise: Blog tour of the Italian south! I recently got some bufala mozzarella at DiLaurentis (Pike Place Market) and made me a small lasagne with it!! SOO good. I also just ate some with shredded basil. It was a huge treat for someone with lactose issues…. I love this cheese! First had it at a cafe on the piazza in Sorrento, with Mom! Also had my first taste of Limoncello there. I miss it.